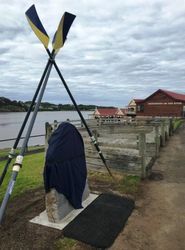 A monument commemorates members of the Warrnambool Rowing Club who enlisted for service in World War One. In November 1916 an Honour Roll was unveiled at Anderson's Café in the presence of a large number of' members and friends. The Mayor said that he had seen it mentioned that the rowing clubs of Victoria had supplied over a thousand men to the war effort. Whilst rowers as a whole had done their share, the Warrnambool Club had achieved a record that could not be surpassed, every member of military age volunteering. He admired the principle of each Club and association erecting Honour Rolls. The Mayor withdrew the Union Jack which had been draped over the Honour Roll, made by Miss Ray Grayson. It was surmounted by the words 'Lest We Forget Honour Roll of Members and ex-Members.' On either side of the space containing the names were national flags, the Union Jack on one side and the Commonwealth flag on the other. Honour Roll of Warrnambool Rowing Club members and ex-members who enlisted for the First World War. Every club member of military age enlisted. A Norfolk Island pine was planted in November 1916 to perpetuate the memory of a former member, Major Thomas Redford, who died at Gallipoli. The tree is believed to be beside the Hopkins River in E J King Park. 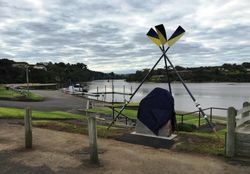 Honour Roll rededicated by the City of Warrnambool Rowing Club and Warrnambool City Council, August 7 2016.